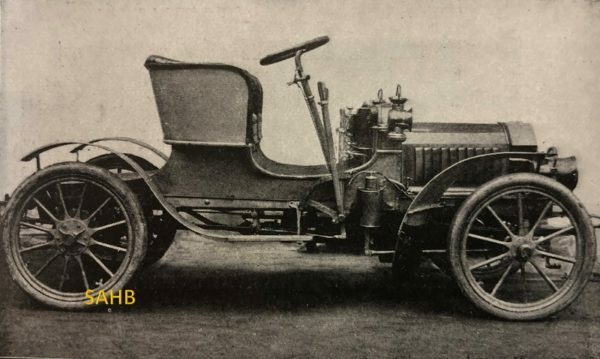 This week’s ‘Snapshot’ features a remarkably low-built voiturette as advertised by its makers, a small northern firm, in February of 1905. Dotted around the country at the beginning of the last Century were a good many practical small-time engineers, some of whom had successfully sold bicycles of their own manufacture. One such was Ralph Jackson of Altrincham, which then was a small semi-rural town on the Chester road a few miles from central Manchester. Seeing a future in the new powered vehicles, Jackson went into partnership in November of 1899 with one Arthur Firth, and, trading as the Century Engineering and Motor Co Ltd., they launched a three-wheeled forecar with a 2¼hp single-cylinder engine. Unlike many of its kind, the Century had a distinctive appearance as wheel steering was normally fitted, when rival makes retained cycle-type handlebars, large ‘C’-springs softened the ride for the passenger who ‘enjoyed’ an upholstered seat set between the two front wheels, and the driver’s seat also was insulated from the main frame by leaf springs. The main frame of the Century tricar featured twin parallel steel tubes, and these were braced below by additional lighter-gauge tubing, much as railway carriages were by ‘Pullman’ rods. Subsequent Century and then Eagle models can be so identified. Brisk sales encouraged the partners to open a London branch, this occurring in 1901, and the entrepreneurial motor trade figure Sidney Begbie took notice and within months had bought out Jackson and Firth. Jackson lost little time in heading back to Altrincham where he launched the Eagle tricar from a new firm, Eagle Engineering and Motor Co Ltd: the Eagles were almost indistinguishable from the Century! Begbie seems to have raised no objection and for some time both makes were in production and sometimes even appeared on stands at the same shows. The London firm began to offer conventional four-wheeled light cars with proprietary engines, but faltered and then closed in 1907. Meanwhile, the Eagle forecars were joined by light three-wheeled single-seater runabouts – dispensing with passenger accommodation and wholly devoid of weather protection. They were notable for their low build and some were intended primarily for speed, with a scarcely-credible 80mph being claimed for a 4-cylinder 16hp version in 1904. That year saw evolution into four-wheeled Eagle cars and it is one of these that we illustrate above. Jackson favoured epicyclic gearing: his advert claimed ‘simple gears, noiseless running, admirable comfort and an exquisite finish’. The tubular chassis had gone but a curious feature of the tricars remained: the steering column curved through 90º at the top to meet the inside of the steering wheel, making a single spoke – something early Humbers also had, and that was to be revived by Citroën in the then-futuristic DS19 model many years later. From 1905, Eagle’s fortunes waxed and waned: larger cars were made in small numbers and then after a break of several years, in 1913 Jackson launched a cyclecar. It failed; but the business continued with general motor sales, servicing and repairs, and today Jackson’s old premises remain as a car dealership.